This entry was posted in Uncategorized on 30. January 2017 by te-bachi. return a value, and can’t affect the overall state of the calculator. can do anything, but don’t return a value directly. Strangely enough, if you enter an imaginary number into the round() command, nothing happens and the calculator returns the same function in a simplified form. This entry was posted in Uncategorized on 19. January 2017 by te-bachi. This entry was posted in Uncategorized on 15. January 2017 by te-bachi. This entry was posted in Uncategorized on 14. January 2017 by te-bachi. This entry was posted in Uncategorized on 13. January 2017 by te-bachi. matplotlib.use required before other imports clashes with pep8. Ignore or fix? This entry was posted in Uncategorized on 5. January 2017 by te-bachi. The Nordic nRF24L01+ is a highly integrated, ultra low power (ULP) 2Mbps RF transceiver IC for the 2.4GHz ISM (Industrial, Scientific and Medical) band. The nRF52832 SoC is a powerful, highly flexible ultra-low power multiprotocol SoC ideally suited for Bluetooth low energy (previously called Bluetooth Smart), ANT and 2.4GHz ultra low-power wireless applications. 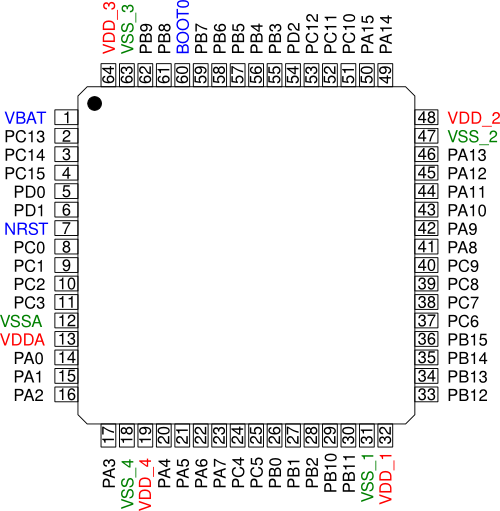 The nRF52832 SoC is built around a 32-bit ARM Cortex-M4F CPU with 512kB + 64kB RAM. The Nordic nRF905 is a highly integrated, low power, multiband RF transceiver IC for the 433/868/915MHz ISM (Industrial, Scientific and Medical) band. What is the difference between SX1272 and SX1276? Wire library has SCL and SDA definitions but then doesn’t use them. Found DFU: [0x1eaf:0x0003] devnum=1, cfg=0, intf=0, alt=0, name=""
Found DFU: [0x1eaf:0x0003] devnum=1, cfg=0, intf=0, alt=1, name="STM32duino bootloader v1.0  Upload to Flash 0x8005000"
Found DFU: [0x1eaf:0x0003] devnum=1, cfg=0, intf=0, alt=2, name="STM32duino bootloader v1.0  Upload to Flash 0x8002000"
Sketch uses 12892 bytes (19%) of program storage space. Maximum is 65536 bytes. 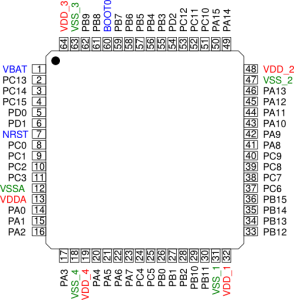 Global variables use 2816 bytes of dynamic memory. 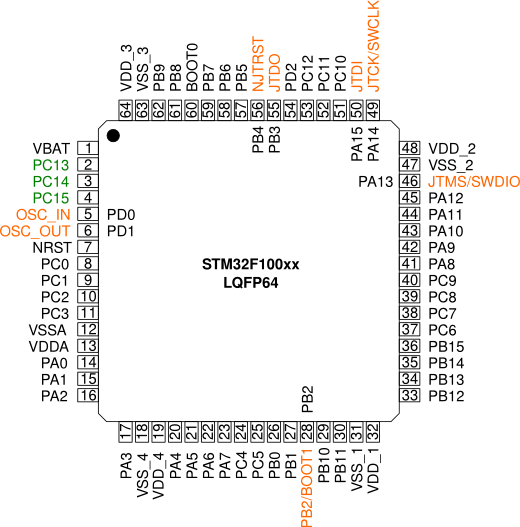 Low-density devices are STM32F101xx, STM32F102xx and STM32F103xx microcontrollers where the Flash memory density ranges between 16 and 32 Kbytes. Medium-density devices are STM32F101xx, STM32F102xx and STM32F103xx microcontrollers where the Flash memory density ranges between 64 and 128 Kbytes. High-density devices are STM32F101xx and STM32F103xx microcontrollers where the Flash memory density ranges between 256 and 512 Kbytes. XL-density devices are STM32F101xx and STM32F103xx microcontrollers where the Flash memory density ranges between 768 Kbytes and 1 Mbyte. Connectivity line devices are STM32F105xx and STM32F107xx microcontrollers. For this document, we are only interested in that the Cortex-M3 core is connected to the AHB system bus, which is then split into two bridges APB1 (low speed) and APB2 (high speed) with each bridge connecting to a set of peripherals. The I/Os alternate function configuration can be locked if needed following a specific sequence in order to avoid spurious writing to the I/Os registers. 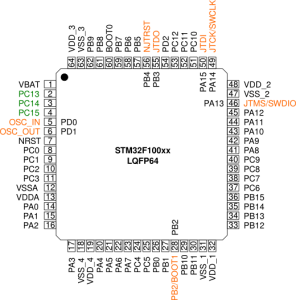 I/O pin multiplexer and mapping: pins are connected to on-chip peripherals/modules through a multiplexer that allows only one peripheral alternate function (AF) connected to an I/O pin at a time. In this way, there can be no conflict between peripherals sharing the same I/O pin. The STM32F3 series GPIO peripheral is a new design and thus the architecture, features and registers are different from the GPIO peripheral in the STM32F1 series. 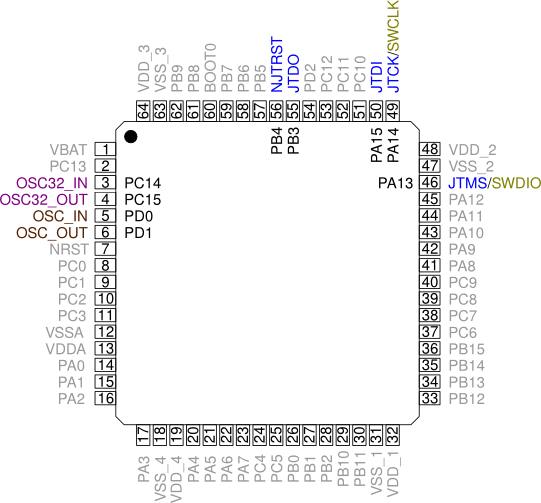 Any code written for the STM32F1 series using the GPIO needs to be rewritten to run on STM32F3 series. The configuration to use an I/O as an alternate function depends on the peripheral mode used. For example, the USART Tx pin should be configured as an alternate function push-pull, while the USART Rx pin should be configured as input floating or input pull-up. To optimize the number of peripheral I/O functions for different device packages (especially those with a low pin count), it is possible to remap some alternate functions to other pins by software. 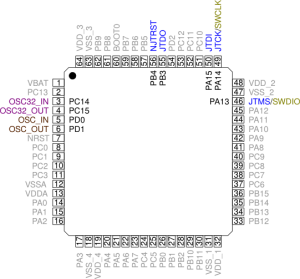 For example, the USART2_RX pin can be mapped on PA3 (default remap) or PD6 (by software remap). then the system can use the I/O in the proper way (input or output). The I/O pins are connected to on-chip peripherals/modules through a multiplexer that allows only one peripheral alternate function to be connected to an I/O pin at a time. In this way, there can be no conflict between peripherals sharing the same I/O pin. 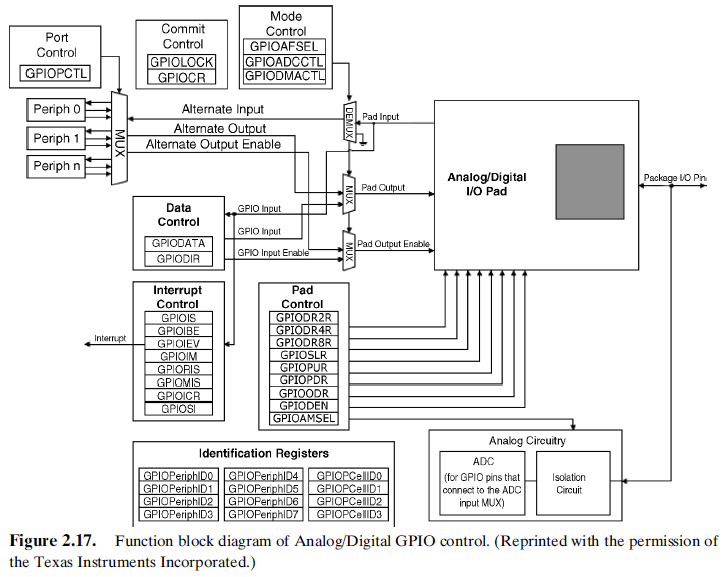 Each I/O pin has a multiplexer with 16 alternate function inputs (AF0 to AF15) that can be configured through the GPIOx_AFRL and GPIOx_AFRH registers: the peripheral alternate functions are mapped by configuring AF0 to AF15. 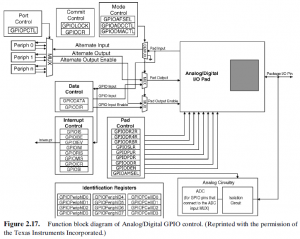 In addition to this flexible I/O multiplexing architecture, each peripheral has alternate functions mapped on different I/O pins to optimize the number of peripheral I/O functions for different device packages. For example, the USART2_RX pin can be mapped on PA3 or PA15 pin. To optimize the number of peripherals available for the 64-pin or the 100-pin or the 144-pin package, it is possible to remap some alternate functions to some other pins. This is achieved by software, by programming the AF remap and debug I/O configuration register (AFIO_MAPR). In this case, the alternate functions are no longer mapped to their original assignations. When an input pin is in high impedance input mode, its state is indeterminate unless it is driven high or low by an external source. Pins configured as high impedance inputs and not currently driven are called “floating”. Many times “float” or “floating” is used interchaneably with “high impedance” or “tri-stated”. To prevent pins from floating when they are not externally driven, internally pulling resistors are used. Was ist ein Pullup- und ein Pulldown-Widerstand? The alternate functions are the internal peripheral device connections to the external pins. 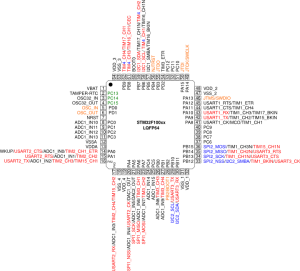 Alternate functions shown in red can be remapped to other port pins. 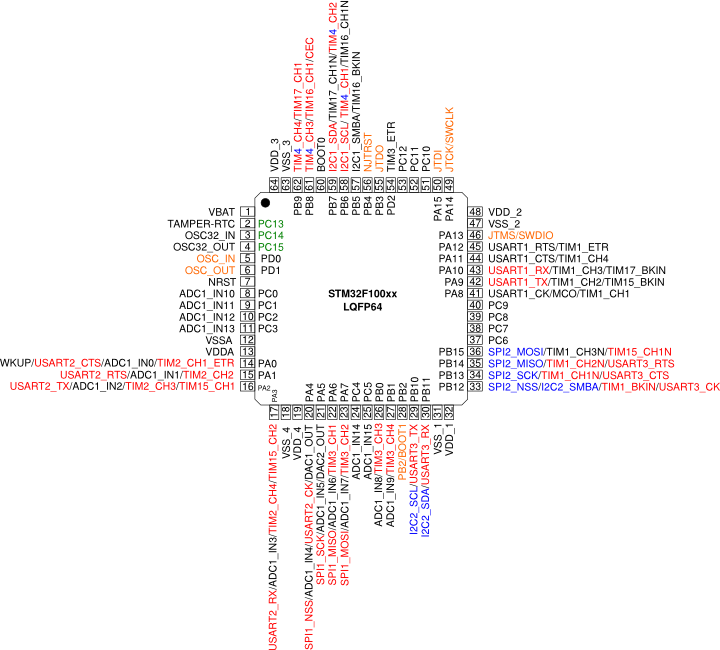 arm-none-eabi-gcc -mcpu=cortex-m3 -mthumb -Og -fmessage-length=0 -fsigned-char -ffunction-sections -fdata-sections -ffreestanding -fno-move-loop-invariants -Wall -Wextra  -g3 -DDEBUG -DUSE_FULL_ASSERT -DTRACE -DOS_USE_TRACE_SEMIHOSTING_DEBUG -DSTM32F10X_MD -DUSE_STDPERIPH_DRIVER -DHSE_VALUE=8000000 -I"../include" -I"../system/include" -I"../system/include/cmsis" -I"../system/include/stm32f1-stdperiph" -std=gnu11 -MMD -MP -MF"system/src/stm32f1-stdperiph/misc.d" -MT"system/src/stm32f1-stdperiph/misc.o" -c -o "system/src/stm32f1-stdperiph/misc.o" "../system/src/stm32f1-stdperiph/misc.c"
arm-none-eabi-gcc -mcpu=cortex-m3 -mthumb -Og -fmessage-length=0 -fsigned-char -ffunction-sections -fdata-sections -ffreestanding -fno-move-loop-invariants -Wall -Wextra  -g3 -DDEBUG -DUSE_FULL_ASSERT -DTRACE -DOS_USE_TRACE_SEMIHOSTING_DEBUG -DSTM32F10X_MD -DUSE_STDPERIPH_DRIVER -DHSE_VALUE=8000000 -I"../include" -I"../system/include" -I"../system/include/cmsis" -I"../system/include/stm32f1-stdperiph" -std=gnu11 -MMD -MP -MF"system/src/stm32f1-stdperiph/stm32f10x_adc.d" -MT"system/src/stm32f1-stdperiph/stm32f10x_adc.o" -c -o "system/src/stm32f1-stdperiph/stm32f10x_adc.o" "../system/src/stm32f1-stdperiph/stm32f10x_adc.c"
arm-none-eabi-gcc -mcpu=cortex-m3 -mthumb -Og -fmessage-length=0 -fsigned-char -ffunction-sections -fdata-sections -ffreestanding -fno-move-loop-invariants -Wall -Wextra  -g3 -DDEBUG -DUSE_FULL_ASSERT -DTRACE -DOS_USE_TRACE_SEMIHOSTING_DEBUG -DSTM32F10X_MD -DUSE_STDPERIPH_DRIVER -DHSE_VALUE=8000000 -I"../include" -I"../system/include" -I"../system/include/cmsis" -I"../system/include/stm32f1-stdperiph" -std=gnu11 -MMD -MP -MF"system/src/stm32f1-stdperiph/stm32f10x_bkp.d" -MT"system/src/stm32f1-stdperiph/stm32f10x_bkp.o" -c -o "system/src/stm32f1-stdperiph/stm32f10x_bkp.o" "../system/src/stm32f1-stdperiph/stm32f10x_bkp.c"
arm-none-eabi-gcc -mcpu=cortex-m3 -mthumb -Og -fmessage-length=0 -fsigned-char -ffunction-sections -fdata-sections -ffreestanding -fno-move-loop-invariants -Wall -Wextra  -g3 -DDEBUG -DUSE_FULL_ASSERT -DTRACE -DOS_USE_TRACE_SEMIHOSTING_DEBUG -DSTM32F10X_MD -DUSE_STDPERIPH_DRIVER -DHSE_VALUE=8000000 -I"../include" -I"../system/include" -I"../system/include/cmsis" -I"../system/include/stm32f1-stdperiph" -std=gnu11 -MMD -MP -MF"system/src/stm32f1-stdperiph/stm32f10x_can.d" -MT"system/src/stm32f1-stdperiph/stm32f10x_can.o" -c -o "system/src/stm32f1-stdperiph/stm32f10x_can.o" "../system/src/stm32f1-stdperiph/stm32f10x_can.c"
arm-none-eabi-gcc -mcpu=cortex-m3 -mthumb -Og -fmessage-length=0 -fsigned-char -ffunction-sections -fdata-sections -ffreestanding -fno-move-loop-invariants -Wall -Wextra  -g3 -DDEBUG -DUSE_FULL_ASSERT -DTRACE -DOS_USE_TRACE_SEMIHOSTING_DEBUG -DSTM32F10X_MD -DUSE_STDPERIPH_DRIVER -DHSE_VALUE=8000000 -I"../include" -I"../system/include" -I"../system/include/cmsis" -I"../system/include/stm32f1-stdperiph" -std=gnu11 -MMD -MP -MF"system/src/stm32f1-stdperiph/stm32f10x_cec.d" -MT"system/src/stm32f1-stdperiph/stm32f10x_cec.o" -c -o "system/src/stm32f1-stdperiph/stm32f10x_cec.o" "../system/src/stm32f1-stdperiph/stm32f10x_cec.c"
arm-none-eabi-gcc -mcpu=cortex-m3 -mthumb -Og -fmessage-length=0 -fsigned-char -ffunction-sections -fdata-sections -ffreestanding -fno-move-loop-invariants -Wall -Wextra  -g3 -DDEBUG -DUSE_FULL_ASSERT -DTRACE -DOS_USE_TRACE_SEMIHOSTING_DEBUG -DSTM32F10X_MD -DUSE_STDPERIPH_DRIVER -DHSE_VALUE=8000000 -I"../include" -I"../system/include" -I"../system/include/cmsis" -I"../system/include/stm32f1-stdperiph" -std=gnu11 -MMD -MP -MF"system/src/stm32f1-stdperiph/stm32f10x_crc.d" -MT"system/src/stm32f1-stdperiph/stm32f10x_crc.o" -c -o "system/src/stm32f1-stdperiph/stm32f10x_crc.o" "../system/src/stm32f1-stdperiph/stm32f10x_crc.c"
arm-none-eabi-gcc -mcpu=cortex-m3 -mthumb -Og -fmessage-length=0 -fsigned-char -ffunction-sections -fdata-sections -ffreestanding -fno-move-loop-invariants -Wall -Wextra  -g3 -DDEBUG -DUSE_FULL_ASSERT -DTRACE -DOS_USE_TRACE_SEMIHOSTING_DEBUG -DSTM32F10X_MD -DUSE_STDPERIPH_DRIVER -DHSE_VALUE=8000000 -I"../include" -I"../system/include" -I"../system/include/cmsis" -I"../system/include/stm32f1-stdperiph" -std=gnu11 -MMD -MP -MF"system/src/stm32f1-stdperiph/stm32f10x_dac.d" -MT"system/src/stm32f1-stdperiph/stm32f10x_dac.o" -c -o "system/src/stm32f1-stdperiph/stm32f10x_dac.o" "../system/src/stm32f1-stdperiph/stm32f10x_dac.c"
arm-none-eabi-gcc -mcpu=cortex-m3 -mthumb -Og -fmessage-length=0 -fsigned-char -ffunction-sections -fdata-sections -ffreestanding -fno-move-loop-invariants -Wall -Wextra  -g3 -DDEBUG -DUSE_FULL_ASSERT -DTRACE -DOS_USE_TRACE_SEMIHOSTING_DEBUG -DSTM32F10X_MD -DUSE_STDPERIPH_DRIVER -DHSE_VALUE=8000000 -I"../include" -I"../system/include" -I"../system/include/cmsis" -I"../system/include/stm32f1-stdperiph" -std=gnu11 -MMD -MP -MF"system/src/stm32f1-stdperiph/stm32f10x_dbgmcu.d" -MT"system/src/stm32f1-stdperiph/stm32f10x_dbgmcu.o" -c -o "system/src/stm32f1-stdperiph/stm32f10x_dbgmcu.o" "../system/src/stm32f1-stdperiph/stm32f10x_dbgmcu.c"
arm-none-eabi-gcc -mcpu=cortex-m3 -mthumb -Og -fmessage-length=0 -fsigned-char -ffunction-sections -fdata-sections -ffreestanding -fno-move-loop-invariants -Wall -Wextra  -g3 -DDEBUG -DUSE_FULL_ASSERT -DTRACE -DOS_USE_TRACE_SEMIHOSTING_DEBUG -DSTM32F10X_MD -DUSE_STDPERIPH_DRIVER -DHSE_VALUE=8000000 -I"../include" -I"../system/include" -I"../system/include/cmsis" -I"../system/include/stm32f1-stdperiph" -std=gnu11 -MMD -MP -MF"system/src/stm32f1-stdperiph/stm32f10x_dma.d" -MT"system/src/stm32f1-stdperiph/stm32f10x_dma.o" -c -o "system/src/stm32f1-stdperiph/stm32f10x_dma.o" "../system/src/stm32f1-stdperiph/stm32f10x_dma.c"
arm-none-eabi-gcc -mcpu=cortex-m3 -mthumb -Og -fmessage-length=0 -fsigned-char -ffunction-sections -fdata-sections -ffreestanding -fno-move-loop-invariants -Wall -Wextra  -g3 -DDEBUG -DUSE_FULL_ASSERT -DTRACE -DOS_USE_TRACE_SEMIHOSTING_DEBUG -DSTM32F10X_MD -DUSE_STDPERIPH_DRIVER -DHSE_VALUE=8000000 -I"../include" -I"../system/include" -I"../system/include/cmsis" -I"../system/include/stm32f1-stdperiph" -std=gnu11 -MMD -MP -MF"system/src/stm32f1-stdperiph/stm32f10x_exti.d" -MT"system/src/stm32f1-stdperiph/stm32f10x_exti.o" -c -o "system/src/stm32f1-stdperiph/stm32f10x_exti.o" "../system/src/stm32f1-stdperiph/stm32f10x_exti.c"
arm-none-eabi-gcc -mcpu=cortex-m3 -mthumb -Og -fmessage-length=0 -fsigned-char -ffunction-sections -fdata-sections -ffreestanding -fno-move-loop-invariants -Wall -Wextra  -g3 -DDEBUG -DUSE_FULL_ASSERT -DTRACE -DOS_USE_TRACE_SEMIHOSTING_DEBUG -DSTM32F10X_MD -DUSE_STDPERIPH_DRIVER -DHSE_VALUE=8000000 -I"../include" -I"../system/include" -I"../system/include/cmsis" -I"../system/include/stm32f1-stdperiph" -std=gnu11 -MMD -MP -MF"system/src/stm32f1-stdperiph/stm32f10x_flash.d" -MT"system/src/stm32f1-stdperiph/stm32f10x_flash.o" -c -o "system/src/stm32f1-stdperiph/stm32f10x_flash.o" "../system/src/stm32f1-stdperiph/stm32f10x_flash.c"
arm-none-eabi-gcc -mcpu=cortex-m3 -mthumb -Og -fmessage-length=0 -fsigned-char -ffunction-sections -fdata-sections -ffreestanding -fno-move-loop-invariants -Wall -Wextra  -g3 -DDEBUG -DUSE_FULL_ASSERT -DTRACE -DOS_USE_TRACE_SEMIHOSTING_DEBUG -DSTM32F10X_MD -DUSE_STDPERIPH_DRIVER -DHSE_VALUE=8000000 -I"../include" -I"../system/include" -I"../system/include/cmsis" -I"../system/include/stm32f1-stdperiph" -std=gnu11 -MMD -MP -MF"system/src/stm32f1-stdperiph/stm32f10x_fsmc.d" -MT"system/src/stm32f1-stdperiph/stm32f10x_fsmc.o" -c -o "system/src/stm32f1-stdperiph/stm32f10x_fsmc.o" "../system/src/stm32f1-stdperiph/stm32f10x_fsmc.c"
arm-none-eabi-gcc -mcpu=cortex-m3 -mthumb -Og -fmessage-length=0 -fsigned-char -ffunction-sections -fdata-sections -ffreestanding -fno-move-loop-invariants -Wall -Wextra  -g3 -DDEBUG -DUSE_FULL_ASSERT -DTRACE -DOS_USE_TRACE_SEMIHOSTING_DEBUG -DSTM32F10X_MD -DUSE_STDPERIPH_DRIVER -DHSE_VALUE=8000000 -I"../include" -I"../system/include" -I"../system/include/cmsis" -I"../system/include/stm32f1-stdperiph" -std=gnu11 -MMD -MP -MF"system/src/stm32f1-stdperiph/stm32f10x_gpio.d" -MT"system/src/stm32f1-stdperiph/stm32f10x_gpio.o" -c -o "system/src/stm32f1-stdperiph/stm32f10x_gpio.o" "../system/src/stm32f1-stdperiph/stm32f10x_gpio.c"
arm-none-eabi-gcc -mcpu=cortex-m3 -mthumb -Og -fmessage-length=0 -fsigned-char -ffunction-sections -fdata-sections -ffreestanding -fno-move-loop-invariants -Wall -Wextra  -g3 -DDEBUG -DUSE_FULL_ASSERT -DTRACE -DOS_USE_TRACE_SEMIHOSTING_DEBUG -DSTM32F10X_MD -DUSE_STDPERIPH_DRIVER -DHSE_VALUE=8000000 -I"../include" -I"../system/include" -I"../system/include/cmsis" -I"../system/include/stm32f1-stdperiph" -std=gnu11 -MMD -MP -MF"system/src/stm32f1-stdperiph/stm32f10x_i2c.d" -MT"system/src/stm32f1-stdperiph/stm32f10x_i2c.o" -c -o "system/src/stm32f1-stdperiph/stm32f10x_i2c.o" "../system/src/stm32f1-stdperiph/stm32f10x_i2c.c"
arm-none-eabi-gcc -mcpu=cortex-m3 -mthumb -Og -fmessage-length=0 -fsigned-char -ffunction-sections -fdata-sections -ffreestanding -fno-move-loop-invariants -Wall -Wextra  -g3 -DDEBUG -DUSE_FULL_ASSERT -DTRACE -DOS_USE_TRACE_SEMIHOSTING_DEBUG -DSTM32F10X_MD -DUSE_STDPERIPH_DRIVER -DHSE_VALUE=8000000 -I"../include" -I"../system/include" -I"../system/include/cmsis" -I"../system/include/stm32f1-stdperiph" -std=gnu11 -MMD -MP -MF"system/src/stm32f1-stdperiph/stm32f10x_iwdg.d" -MT"system/src/stm32f1-stdperiph/stm32f10x_iwdg.o" -c -o "system/src/stm32f1-stdperiph/stm32f10x_iwdg.o" "../system/src/stm32f1-stdperiph/stm32f10x_iwdg.c"
arm-none-eabi-gcc -mcpu=cortex-m3 -mthumb -Og -fmessage-length=0 -fsigned-char -ffunction-sections -fdata-sections -ffreestanding -fno-move-loop-invariants -Wall -Wextra  -g3 -DDEBUG -DUSE_FULL_ASSERT -DTRACE -DOS_USE_TRACE_SEMIHOSTING_DEBUG -DSTM32F10X_MD -DUSE_STDPERIPH_DRIVER -DHSE_VALUE=8000000 -I"../include" -I"../system/include" -I"../system/include/cmsis" -I"../system/include/stm32f1-stdperiph" -std=gnu11 -MMD -MP -MF"system/src/stm32f1-stdperiph/stm32f10x_pwr.d" -MT"system/src/stm32f1-stdperiph/stm32f10x_pwr.o" -c -o "system/src/stm32f1-stdperiph/stm32f10x_pwr.o" "../system/src/stm32f1-stdperiph/stm32f10x_pwr.c"
arm-none-eabi-gcc -mcpu=cortex-m3 -mthumb -Og -fmessage-length=0 -fsigned-char -ffunction-sections -fdata-sections -ffreestanding -fno-move-loop-invariants -Wall -Wextra  -g3 -DDEBUG -DUSE_FULL_ASSERT -DTRACE -DOS_USE_TRACE_SEMIHOSTING_DEBUG -DSTM32F10X_MD -DUSE_STDPERIPH_DRIVER -DHSE_VALUE=8000000 -I"../include" -I"../system/include" -I"../system/include/cmsis" -I"../system/include/stm32f1-stdperiph" -std=gnu11 -MMD -MP -MF"system/src/stm32f1-stdperiph/stm32f10x_rcc.d" -MT"system/src/stm32f1-stdperiph/stm32f10x_rcc.o" -c -o "system/src/stm32f1-stdperiph/stm32f10x_rcc.o" "../system/src/stm32f1-stdperiph/stm32f10x_rcc.c"
arm-none-eabi-gcc -mcpu=cortex-m3 -mthumb -Og -fmessage-length=0 -fsigned-char -ffunction-sections -fdata-sections -ffreestanding -fno-move-loop-invariants -Wall -Wextra  -g3 -DDEBUG -DUSE_FULL_ASSERT -DTRACE -DOS_USE_TRACE_SEMIHOSTING_DEBUG -DSTM32F10X_MD -DUSE_STDPERIPH_DRIVER -DHSE_VALUE=8000000 -I"../include" -I"../system/include" -I"../system/include/cmsis" -I"../system/include/stm32f1-stdperiph" -std=gnu11 -MMD -MP -MF"system/src/stm32f1-stdperiph/stm32f10x_rtc.d" -MT"system/src/stm32f1-stdperiph/stm32f10x_rtc.o" -c -o "system/src/stm32f1-stdperiph/stm32f10x_rtc.o" "../system/src/stm32f1-stdperiph/stm32f10x_rtc.c"
arm-none-eabi-gcc -mcpu=cortex-m3 -mthumb -Og -fmessage-length=0 -fsigned-char -ffunction-sections -fdata-sections -ffreestanding -fno-move-loop-invariants -Wall -Wextra  -g3 -DDEBUG -DUSE_FULL_ASSERT -DTRACE -DOS_USE_TRACE_SEMIHOSTING_DEBUG -DSTM32F10X_MD -DUSE_STDPERIPH_DRIVER -DHSE_VALUE=8000000 -I"../include" -I"../system/include" -I"../system/include/cmsis" -I"../system/include/stm32f1-stdperiph" -std=gnu11 -MMD -MP -MF"system/src/stm32f1-stdperiph/stm32f10x_sdio.d" -MT"system/src/stm32f1-stdperiph/stm32f10x_sdio.o" -c -o "system/src/stm32f1-stdperiph/stm32f10x_sdio.o" "../system/src/stm32f1-stdperiph/stm32f10x_sdio.c"
arm-none-eabi-gcc -mcpu=cortex-m3 -mthumb -Og -fmessage-length=0 -fsigned-char -ffunction-sections -fdata-sections -ffreestanding -fno-move-loop-invariants -Wall -Wextra  -g3 -DDEBUG -DUSE_FULL_ASSERT -DTRACE -DOS_USE_TRACE_SEMIHOSTING_DEBUG -DSTM32F10X_MD -DUSE_STDPERIPH_DRIVER -DHSE_VALUE=8000000 -I"../include" -I"../system/include" -I"../system/include/cmsis" -I"../system/include/stm32f1-stdperiph" -std=gnu11 -MMD -MP -MF"system/src/stm32f1-stdperiph/stm32f10x_spi.d" -MT"system/src/stm32f1-stdperiph/stm32f10x_spi.o" -c -o "system/src/stm32f1-stdperiph/stm32f10x_spi.o" "../system/src/stm32f1-stdperiph/stm32f10x_spi.c"
arm-none-eabi-gcc -mcpu=cortex-m3 -mthumb -Og -fmessage-length=0 -fsigned-char -ffunction-sections -fdata-sections -ffreestanding -fno-move-loop-invariants -Wall -Wextra  -g3 -DDEBUG -DUSE_FULL_ASSERT -DTRACE -DOS_USE_TRACE_SEMIHOSTING_DEBUG -DSTM32F10X_MD -DUSE_STDPERIPH_DRIVER -DHSE_VALUE=8000000 -I"../include" -I"../system/include" -I"../system/include/cmsis" -I"../system/include/stm32f1-stdperiph" -std=gnu11 -MMD -MP -MF"system/src/stm32f1-stdperiph/stm32f10x_tim.d" -MT"system/src/stm32f1-stdperiph/stm32f10x_tim.o" -c -o "system/src/stm32f1-stdperiph/stm32f10x_tim.o" "../system/src/stm32f1-stdperiph/stm32f10x_tim.c"
arm-none-eabi-gcc -mcpu=cortex-m3 -mthumb -Og -fmessage-length=0 -fsigned-char -ffunction-sections -fdata-sections -ffreestanding -fno-move-loop-invariants -Wall -Wextra  -g3 -DDEBUG -DUSE_FULL_ASSERT -DTRACE -DOS_USE_TRACE_SEMIHOSTING_DEBUG -DSTM32F10X_MD -DUSE_STDPERIPH_DRIVER -DHSE_VALUE=8000000 -I"../include" -I"../system/include" -I"../system/include/cmsis" -I"../system/include/stm32f1-stdperiph" -std=gnu11 -MMD -MP -MF"system/src/stm32f1-stdperiph/stm32f10x_usart.d" -MT"system/src/stm32f1-stdperiph/stm32f10x_usart.o" -c -o "system/src/stm32f1-stdperiph/stm32f10x_usart.o" "../system/src/stm32f1-stdperiph/stm32f10x_usart.c"
arm-none-eabi-gcc -mcpu=cortex-m3 -mthumb -Og -fmessage-length=0 -fsigned-char -ffunction-sections -fdata-sections -ffreestanding -fno-move-loop-invariants -Wall -Wextra  -g3 -DDEBUG -DUSE_FULL_ASSERT -DTRACE -DOS_USE_TRACE_SEMIHOSTING_DEBUG -DSTM32F10X_MD -DUSE_STDPERIPH_DRIVER -DHSE_VALUE=8000000 -I"../include" -I"../system/include" -I"../system/include/cmsis" -I"../system/include/stm32f1-stdperiph" -std=gnu11 -MMD -MP -MF"system/src/stm32f1-stdperiph/stm32f10x_wwdg.d" -MT"system/src/stm32f1-stdperiph/stm32f10x_wwdg.o" -c -o "system/src/stm32f1-stdperiph/stm32f10x_wwdg.o" "../system/src/stm32f1-stdperiph/stm32f10x_wwdg.c"
arm-none-eabi-g++ -mcpu=cortex-m3 -mthumb -Og -fmessage-length=0 -fsigned-char -ffunction-sections -fdata-sections -ffreestanding -fno-move-loop-invariants -Wall -Wextra  -g3 -DDEBUG -DUSE_FULL_ASSERT -DTRACE -DOS_USE_TRACE_SEMIHOSTING_DEBUG -DSTM32F10X_MD -DUSE_STDPERIPH_DRIVER -DHSE_VALUE=8000000 -I"../include" -I"../system/include" -I"../system/include/cmsis" -I"../system/include/stm32f1-stdperiph" -std=gnu++11 -fabi-version=0 -fno-exceptions -fno-rtti -fno-use-cxa-atexit -fno-threadsafe-statics -MMD -MP -MF"system/src/newlib/_cxx.d" -MT"system/src/newlib/_cxx.o" -c -o "system/src/newlib/_cxx.o" "../system/src/newlib/_cxx.cpp"
arm-none-eabi-gcc -mcpu=cortex-m3 -mthumb -Og -fmessage-length=0 -fsigned-char -ffunction-sections -fdata-sections -ffreestanding -fno-move-loop-invariants -Wall -Wextra  -g3 -DDEBUG -DUSE_FULL_ASSERT -DTRACE -DOS_USE_TRACE_SEMIHOSTING_DEBUG -DSTM32F10X_MD -DUSE_STDPERIPH_DRIVER -DHSE_VALUE=8000000 -I"../include" -I"../system/include" -I"../system/include/cmsis" -I"../system/include/stm32f1-stdperiph" -std=gnu11 -MMD -MP -MF"system/src/newlib/_exit.d" -MT"system/src/newlib/_exit.o" -c -o "system/src/newlib/_exit.o" "../system/src/newlib/_exit.c"
arm-none-eabi-gcc -mcpu=cortex-m3 -mthumb -Og -fmessage-length=0 -fsigned-char -ffunction-sections -fdata-sections -ffreestanding -fno-move-loop-invariants -Wall -Wextra  -g3 -DDEBUG -DUSE_FULL_ASSERT -DTRACE -DOS_USE_TRACE_SEMIHOSTING_DEBUG -DSTM32F10X_MD -DUSE_STDPERIPH_DRIVER -DHSE_VALUE=8000000 -I"../include" -I"../system/include" -I"../system/include/cmsis" -I"../system/include/stm32f1-stdperiph" -std=gnu11 -MMD -MP -MF"system/src/newlib/_sbrk.d" -MT"system/src/newlib/_sbrk.o" -c -o "system/src/newlib/_sbrk.o" "../system/src/newlib/_sbrk.c"
arm-none-eabi-gcc -mcpu=cortex-m3 -mthumb -Og -fmessage-length=0 -fsigned-char -ffunction-sections -fdata-sections -ffreestanding -fno-move-loop-invariants -Wall -Wextra  -g3 -DDEBUG -DUSE_FULL_ASSERT -DTRACE -DOS_USE_TRACE_SEMIHOSTING_DEBUG -DSTM32F10X_MD -DUSE_STDPERIPH_DRIVER -DHSE_VALUE=8000000 -I"../include" -I"../system/include" -I"../system/include/cmsis" -I"../system/include/stm32f1-stdperiph" -std=gnu11 -MMD -MP -MF"system/src/newlib/_startup.d" -MT"system/src/newlib/_startup.o" -c -o "system/src/newlib/_startup.o" "../system/src/newlib/_startup.c"
arm-none-eabi-gcc -mcpu=cortex-m3 -mthumb -Og -fmessage-length=0 -fsigned-char -ffunction-sections -fdata-sections -ffreestanding -fno-move-loop-invariants -Wall -Wextra  -g3 -DDEBUG -DUSE_FULL_ASSERT -DTRACE -DOS_USE_TRACE_SEMIHOSTING_DEBUG -DSTM32F10X_MD -DUSE_STDPERIPH_DRIVER -DHSE_VALUE=8000000 -I"../include" -I"../system/include" -I"../system/include/cmsis" -I"../system/include/stm32f1-stdperiph" -std=gnu11 -MMD -MP -MF"system/src/newlib/_syscalls.d" -MT"system/src/newlib/_syscalls.o" -c -o "system/src/newlib/_syscalls.o" "../system/src/newlib/_syscalls.c"
arm-none-eabi-gcc -mcpu=cortex-m3 -mthumb -Og -fmessage-length=0 -fsigned-char -ffunction-sections -fdata-sections -ffreestanding -fno-move-loop-invariants -Wall -Wextra  -g3 -DDEBUG -DUSE_FULL_ASSERT -DTRACE -DOS_USE_TRACE_SEMIHOSTING_DEBUG -DSTM32F10X_MD -DUSE_STDPERIPH_DRIVER -DHSE_VALUE=8000000 -I"../include" -I"../system/include" -I"../system/include/cmsis" -I"../system/include/stm32f1-stdperiph" -std=gnu11 -MMD -MP -MF"system/src/newlib/assert.d" -MT"system/src/newlib/assert.o" -c -o "system/src/newlib/assert.o" "../system/src/newlib/assert.c"
arm-none-eabi-gcc -mcpu=cortex-m3 -mthumb -Og -fmessage-length=0 -fsigned-char -ffunction-sections -fdata-sections -ffreestanding -fno-move-loop-invariants -Wall -Wextra  -g3 -DDEBUG -DUSE_FULL_ASSERT -DTRACE -DOS_USE_TRACE_SEMIHOSTING_DEBUG -DSTM32F10X_MD -DUSE_STDPERIPH_DRIVER -DHSE_VALUE=8000000 -I"../include" -I"../system/include" -I"../system/include/cmsis" -I"../system/include/stm32f1-stdperiph" -std=gnu11 -MMD -MP -MF"system/src/diag/Trace.d" -MT"system/src/diag/Trace.o" -c -o "system/src/diag/Trace.o" "../system/src/diag/Trace.c"
arm-none-eabi-gcc -mcpu=cortex-m3 -mthumb -Og -fmessage-length=0 -fsigned-char -ffunction-sections -fdata-sections -ffreestanding -fno-move-loop-invariants -Wall -Wextra  -g3 -DDEBUG -DUSE_FULL_ASSERT -DTRACE -DOS_USE_TRACE_SEMIHOSTING_DEBUG -DSTM32F10X_MD -DUSE_STDPERIPH_DRIVER -DHSE_VALUE=8000000 -I"../include" -I"../system/include" -I"../system/include/cmsis" -I"../system/include/stm32f1-stdperiph" -std=gnu11 -MMD -MP -MF"system/src/diag/trace_impl.d" -MT"system/src/diag/trace_impl.o" -c -o "system/src/diag/trace_impl.o" "../system/src/diag/trace_impl.c"
arm-none-eabi-gcc -mcpu=cortex-m3 -mthumb -Og -fmessage-length=0 -fsigned-char -ffunction-sections -fdata-sections -ffreestanding -fno-move-loop-invariants -Wall -Wextra  -g3 -DDEBUG -DUSE_FULL_ASSERT -DTRACE -DOS_USE_TRACE_SEMIHOSTING_DEBUG -DSTM32F10X_MD -DUSE_STDPERIPH_DRIVER -DHSE_VALUE=8000000 -I"../include" -I"../system/include" -I"../system/include/cmsis" -I"../system/include/stm32f1-stdperiph" -std=gnu11 -MMD -MP -MF"system/src/cortexm/_initialize_hardware.d" -MT"system/src/cortexm/_initialize_hardware.o" -c -o "system/src/cortexm/_initialize_hardware.o" "../system/src/cortexm/_initialize_hardware.c"
arm-none-eabi-gcc -mcpu=cortex-m3 -mthumb -Og -fmessage-length=0 -fsigned-char -ffunction-sections -fdata-sections -ffreestanding -fno-move-loop-invariants -Wall -Wextra  -g3 -DDEBUG -DUSE_FULL_ASSERT -DTRACE -DOS_USE_TRACE_SEMIHOSTING_DEBUG -DSTM32F10X_MD -DUSE_STDPERIPH_DRIVER -DHSE_VALUE=8000000 -I"../include" -I"../system/include" -I"../system/include/cmsis" -I"../system/include/stm32f1-stdperiph" -std=gnu11 -MMD -MP -MF"system/src/cortexm/_reset_hardware.d" -MT"system/src/cortexm/_reset_hardware.o" -c -o "system/src/cortexm/_reset_hardware.o" "../system/src/cortexm/_reset_hardware.c"
arm-none-eabi-gcc -mcpu=cortex-m3 -mthumb -Og -fmessage-length=0 -fsigned-char -ffunction-sections -fdata-sections -ffreestanding -fno-move-loop-invariants -Wall -Wextra  -g3 -DDEBUG -DUSE_FULL_ASSERT -DTRACE -DOS_USE_TRACE_SEMIHOSTING_DEBUG -DSTM32F10X_MD -DUSE_STDPERIPH_DRIVER -DHSE_VALUE=8000000 -I"../include" -I"../system/include" -I"../system/include/cmsis" -I"../system/include/stm32f1-stdperiph" -std=gnu11 -MMD -MP -MF"system/src/cortexm/exception_handlers.d" -MT"system/src/cortexm/exception_handlers.o" -c -o "system/src/cortexm/exception_handlers.o" "../system/src/cortexm/exception_handlers.c"
arm-none-eabi-gcc -mcpu=cortex-m3 -mthumb -Og -fmessage-length=0 -fsigned-char -ffunction-sections -fdata-sections -ffreestanding -fno-move-loop-invariants -Wall -Wextra  -g3 -DDEBUG -DUSE_FULL_ASSERT -DTRACE -DOS_USE_TRACE_SEMIHOSTING_DEBUG -DSTM32F10X_MD -DUSE_STDPERIPH_DRIVER -DHSE_VALUE=8000000 -I"../include" -I"../system/include" -I"../system/include/cmsis" -I"../system/include/stm32f1-stdperiph" -std=gnu11 -MMD -MP -MF"system/src/cmsis/system_stm32f10x.d" -MT"system/src/cmsis/system_stm32f10x.o" -c -o "system/src/cmsis/system_stm32f10x.o" "../system/src/cmsis/system_stm32f10x.c"
arm-none-eabi-gcc -mcpu=cortex-m3 -mthumb -Og -fmessage-length=0 -fsigned-char -ffunction-sections -fdata-sections -ffreestanding -fno-move-loop-invariants -Wall -Wextra  -g3 -DDEBUG -DUSE_FULL_ASSERT -DTRACE -DOS_USE_TRACE_SEMIHOSTING_DEBUG -DSTM32F10X_MD -DUSE_STDPERIPH_DRIVER -DHSE_VALUE=8000000 -I"../include" -I"../system/include" -I"../system/include/cmsis" -I"../system/include/stm32f1-stdperiph" -std=gnu11 -MMD -MP -MF"system/src/cmsis/vectors_stm32f10x.d" -MT"system/src/cmsis/vectors_stm32f10x.o" -c -o "system/src/cmsis/vectors_stm32f10x.o" "../system/src/cmsis/vectors_stm32f10x.c"
arm-none-eabi-g++ -mcpu=cortex-m3 -mthumb -Og -fmessage-length=0 -fsigned-char -ffunction-sections -fdata-sections -ffreestanding -fno-move-loop-invariants -Wall -Wextra  -g3 -DDEBUG -DUSE_FULL_ASSERT -DTRACE -DOS_USE_TRACE_SEMIHOSTING_DEBUG -DSTM32F10X_MD -DUSE_STDPERIPH_DRIVER -DHSE_VALUE=8000000 -I"../include" -I"../system/include" -I"../system/include/cmsis" -I"../system/include/stm32f1-stdperiph" -std=gnu++11 -fabi-version=0 -fno-exceptions -fno-rtti -fno-use-cxa-atexit -fno-threadsafe-statics -MMD -MP -MF"src/BlinkLed.d" -MT"src/BlinkLed.o" -c -o "src/BlinkLed.o" "../src/BlinkLed.cpp"
arm-none-eabi-g++ -mcpu=cortex-m3 -mthumb -Og -fmessage-length=0 -fsigned-char -ffunction-sections -fdata-sections -ffreestanding -fno-move-loop-invariants -Wall -Wextra  -g3 -DDEBUG -DUSE_FULL_ASSERT -DTRACE -DOS_USE_TRACE_SEMIHOSTING_DEBUG -DSTM32F10X_MD -DUSE_STDPERIPH_DRIVER -DHSE_VALUE=8000000 -I"../include" -I"../system/include" -I"../system/include/cmsis" -I"../system/include/stm32f1-stdperiph" -std=gnu++11 -fabi-version=0 -fno-exceptions -fno-rtti -fno-use-cxa-atexit -fno-threadsafe-statics -MMD -MP -MF"src/Timer.d" -MT"src/Timer.o" -c -o "src/Timer.o" "../src/Timer.cpp"
arm-none-eabi-gcc -mcpu=cortex-m3 -mthumb -Og -fmessage-length=0 -fsigned-char -ffunction-sections -fdata-sections -ffreestanding -fno-move-loop-invariants -Wall -Wextra  -g3 -DDEBUG -DUSE_FULL_ASSERT -DTRACE -DOS_USE_TRACE_SEMIHOSTING_DEBUG -DSTM32F10X_MD -DUSE_STDPERIPH_DRIVER -DHSE_VALUE=8000000 -I"../include" -I"../system/include" -I"../system/include/cmsis" -I"../system/include/stm32f1-stdperiph" -std=gnu11 -MMD -MP -MF"src/_write.d" -MT"src/_write.o" -c -o "src/_write.o" "../src/_write.c"
arm-none-eabi-g++ -mcpu=cortex-m3 -mthumb -Og -fmessage-length=0 -fsigned-char -ffunction-sections -fdata-sections -ffreestanding -fno-move-loop-invariants -Wall -Wextra  -g3 -DDEBUG -DUSE_FULL_ASSERT -DTRACE -DOS_USE_TRACE_SEMIHOSTING_DEBUG -DSTM32F10X_MD -DUSE_STDPERIPH_DRIVER -DHSE_VALUE=8000000 -I"../include" -I"../system/include" -I"../system/include/cmsis" -I"../system/include/stm32f1-stdperiph" -std=gnu++11 -fabi-version=0 -fno-exceptions -fno-rtti -fno-use-cxa-atexit -fno-threadsafe-statics -MMD -MP -MF"src/main.d" -MT"src/main.o" -c -o "src/main.o" "../src/main.cpp"
arm-none-eabi-objcopy -O ihex "blinky.elf"  "blinky.hex"
This entry was posted in Uncategorized on 1. January 2017 by te-bachi.